Whether by accident or design, the Schwanengesang is a Janus-like work that looks backwards as well as forwards. The seven settings of the poems of Ludwig Rellstab amplify and honour the poet’s connection with Beethoven, and establish Schubert’s right to be the great man’s successor. Just as Beethoven had proved that he was the greatest composer in Vienna by making sublime piano variations of Diabelli’s cobbler’s patch of a theme, we sense that these Rellstab poems would have been set in masterly fashion, whatever their merits. The composer has given his all to a poet who, in other circumstances, might not have detained him overlong. Such is the sheerly musical mastery displayed here that the listener knows that he is listening to great music whether or not he understands the words (millions have listened to Ständchen as a purely instrumental piece of music). This is not to say that the words do not matter in these works, or to deny that they have given rise to inspired musical analogies, but the listener’s enjoyment in the irresistible flow of vocal chamber music is paramount. This is the work of a genius in his thirties, at the height of his youthful powers, and of whom much more is expected. The Rellstab songs are, if you like, the lieder equivalent of Beethoven’s ‘Razumovsky’ Quartets. We know, however, that the last music that Schubert heard in his brother’s house was a performance of a much later work by the same composer: he had begged for a Beethoven string quartet which is far removed from the ‘Razumovsky’ style – the great C sharp minor, Op 131. Poor ill Schubert became so excited by this music – indeed, he was one of the very few people in Vienna who would have been able to fathom its greatness – that the players feared that he would have a seizure. Beethoven was counted an avant-garde composer as much as he was a guardian of the sacred flame of Haydn and Mozart, and the fearlessness, not to say the sublimity, of these last quartets must have played their part in encouraging Schubert into similar bravery in his song explorations – certainly in terms of including an avant-garde element within a cycle written in Beethoven’s honour. That composer’s example showed that it was not for a great creator to sit on his laurels: he had to lead the public, by the nose if necessary, into the future. In these six Heine settings Schubert does just this. These songs are so far removed from Rellstab’s that it is as if we were comparing landscape with moonscape. That poet’s words had been expanded into music. But in the unfamiliar light and shadow of this vast, lunar terrain the strangely powerful words by a new icon of Romanticism are telescoped into some of the most powerfully concise and economical songs ever written. Thus the Rellstab Abschied could be seen, in the context of this cycle, as a farewell to the past, and the rumblings of Der Atlas as heralding the music of the future, yet both representing different sides of the same creative coin. And Heine was very much the poet of the future. He had everything to appeal to the Schubertians (by the agenda of the reading-circle at the beginning of 1828 we know how much they were enthused by his work). Franz von Schober conducted these readings, and how this poet manqué, with his lumbering and pretentious Palingenesien sonnets, must have envied Heine – so well-travelled, so amusing, such a martyr to the pains of love (and respected, not derided for it), so talented. Heine must have seemed the coming man and, in many ways, he was. Here was humour and irony, the deepest feeling as well as the lightest touch, a mastery of prose as much as poetry, a modern voice that boded ill for the forces of political repression and cultural philistinism. And there was a pithy mode of expression in his poetry which had a Goethe-like directness and suitability for musical setting. Heine’s was a name unknown to Beethoven, and it was now up to Schubert to introduce them to each other. We shall see how presently. the whole world of sorrows. would break within my body. Proud heart, you wished it so! or endlessly wretched, proud heart! And now you are wretched! In these few lines (none of the poems has a heading, and Schubert provides his own titles) are united the worlds of Classicism and Romanticism. The story of Atlas is one that might have been explored by Mayrhofer in his Hellenic mode; he would have retold his version of the legend – as in Memnon or Atys. But Heine is more modern in his far more pithy use of metaphor, more interested in his own mythological present than in the mythologised past. He is less concerned with the fate of the Titan Atlas (condemned by Zeus to hold up the sky as a punishment for a revolt against Olympus) than with his own troubles. So it always is with the greatest ‘ich’-centred poet of them all. He shoulders so much grief because of failed love that, with typically unashamed exaggeration, he claims to know what it is to shoulder the weight of the whole world. Schubert shows that he understands this distinction between a world (‘Eine Welt’) of sorrow and the world as a globe-like entity: the song’s title is not Atlas but Der Atlas. This Atlas is a human being who has suffered much. Who can this unhappy giant be? That he is an important and commanding figure is evident from the opening bars. This is a drumroll for a great man as much as for the severity of the Titan’s plight and an acknowledgement of the composer’s reading of the classics. That this dramatic opening also represents a symphonic overture and curtain-raiser to the group (pace countless arguments for its re-ordering) also seems likely. The key is G minor, a tonality which (according to John Reed) Schubert associates with valiant struggles and losing battles. The right hand is awash with tremolo figurations, by no means the first time they have been heard in Schubert’s songs, but the first where they have been given such prominent status. The left hand is heavy with a motif in mighty octaves. This begins with two crotchet Gs, then a climb of a third to a B flat (a semiquaver right at the end of the bar) and a plunge to the F sharp below (the first beat of the second bar). This plangent accented passing note resolves back on G after a beat. The right hand shadows the harmonic changes implied by the left hand. This circular motif is small but very powerful, and we will find it elsewhere in the Heine songs. The descent of a diminished fourth is repeated, as if to add insult to injury. A semiquaver upbeat and two further resounding low Gs complete the four-bar prelude. The effect is both monumental and unsteady, as if Atlas has to shuffle from one position to another in order to keep a grip. For the duration of those accented F sharps we sense how the world teeters precariously, spinning for a moment on an uncertain footing before settling back on its G minor axis. This important left-hand figure sounds strangely familiar, and it comes back, as we might have suspected, to a late work by Beethoven. We have mentioned the inspiration of the C sharp minor String Quartet, but here Schubert is drawn to the late Piano Sonata in C minor Op 111. A look at the Maestoso opening of that work finds the piano crashing down to a low F sharp in the bass in impetuous dotted rhythm; even more important is the theme of the Allegro con brio ed appassionata which is revealed in the bass clef in bars 20 to 22. In these notes – the rise of a minor third, the fall of a diminished fourth, a return to the tonic – lies the kernel of the melody for Der Atlas. The vocal line (‘Ich unglücksel’ger Atlas’) mirrors the melody of the left-hand introduction. Indeed, the pianist now doubles the vocal line, as if one were manacled to the other; this underlines the unremitting nature of the Titan’s fate. Heine’s poem, too pithy for Schubert’s imposing purposes, is expanded by repetition from the very beginning, an insistence which emphasises the idea of ‘stuck here and going nowhere’. The repeated ‘muss ich tragen’ is like someone with a life sentence obsessively telling himself to get used to the idea. The vocal tessitura is weighted towards the bottom of the stave, appropriate to someone so bowed down with problems, but both settings of ‘die ganze Welt’ strain towards an E flat a sixth higher; this charts the upward sweep of a wider view and the burden of a global responsibility. Atlas was the first weightlifter. One does not know whether this was a sport with which Schubert was acquainted in Vienna – it would only have been as a spectator of course! But what now follows is a graphic depiction in music of someone heaving weights first to waist level and then, with superhuman effort, lifting them high into the air for a few moments before dropping them to the ground. Perhaps Schubert imagined the moment when Atlas first manoeuvred the globe on to his shoulders. Thus ‘Unerträgliches’ shifts between G and a diminished seventh on G sharp as the challenge is taken in hand and the burden lifted halfway; a quaver’s gasp and then an extraordinary burst of energy follows as voice and piano swiftly launch the phrase ‘und brechen will mir das Herz’ up the stave. The augmented second at ‘Herz im’ is the ultimate muscular wrench that culminates in the defiant high F sharp of ‘Leibe’. Here something heavy seems held aloft at a huge cost (no singer in my experience finds this passage easy) until the final ‘be’ of ‘Leibe’ falls an exhausted fifth. The effect is terrific. Words and music describe great physical as well as emotional stress (if Schubert died of an aneurism as some commentators believe, his death was literally caused by a breaking heart). The change of direction in the harmony (flats in G minor are replaced by a slew of sharps which steer the music to F sharp major, and thence to B minor) is a superb example of how tension and effort can be added to music (or taken away) by the smallest nudge of the harmonic tiller. The song’s middle section is Heine’s second verse. The rattling right-hand demisemiquavers cease in favour of triplets shared between the hands. There is also an unexpected sharpening of a semitone which lifts the music into B major. There is something strangely, grimly heroic about this, defiant at the same time as infinitely world-weary. The accented left-hand quavers trace a motif which is a major-key variant of the opening music in the bass clef. In rhythms as tightly bound as the wrists of a condemned prisoner the singer addresses himself off the cuff – ‘It’s all your own fault’, he tells his heart. ‘You gambled and lost. You wanted everything or nothing in love, and now you have nothing!’. The wail of diminished harmony for ‘unendlich glücklich’ is balanced by an even more desperate, but quieter, ‘unendlich elend’. Heine’s well-known tendency is to end poems with a throwaway line or unexpected rapier thrust. Here the final coup de grâce is the ‘Und jetzo bist du elend’ as if to say ‘It’s your own fault, so live with it!’. In a reading of the poem the final ‘elend’ is a fragment of Jewish humour at its darkest, a type of self-directed Schadenfreude. This effect is made stronger here by the fact that that is one of the rare Heine lyrics for music which is unrhymed. Every other strophe in the Heine cycle has an ABCB structure. Here the poem seems to end in mid-air without a clinching rhyme, and Atlas’s perpetual plight seems dismissed with a shrug. In Schubert’s song, however, the repeat of ‘unendlich elend’, and a new shift of harmony, mean that the ironic ‘stolzes Herz’ at the end of the strophe’s third line actually sounds like a call to action and the beginning of a brave new thought. Heine had meant to imply, surely, that his once proud heart has been humbled, leaving us to pity him. But Schubert’s dotted rhythms (at ‘stolzes Herz’) underline continuing pride. And ‘Und jetzo bist du elend’ is the most dramatic phrase in the piece with a high G for ‘jetzo’ and a very strong V–I cadence on ‘elend.’ Hardly a throwaway line, and more of a sledgehammer blow than a rapier thrust. But then the composer of Prometheus is a fighter, and is used to heroism in music. In any case, a work inspired by a Beethoven sonata and the Titanic struggle of that composer’s life had to remain heroic. Contrary to the pithy spirit of the poem, Schubert repeats the first verse in a musical contraction of the opening strophe. The voice is enmeshed with the bass octaves with even more constricting effect. We have heard all the material before apart from the truly grandiose (one might be tempted to say Wagnerian) climactic phrase that includes a high A flat (‘die ganze Welt der Schmerzen muss ich tragen’). The raw power of this passage strikes a new note in Schubert’s music. The character seems to emerge with a bloodcurdling cry of pain from the frame that has hitherto contained him. The hammered insistence on the flattened supertonic – also in the piano – seems so much larger than life that we would be tempted to lecture the composer on Heine’s use of exaggeration for ironic effect. But by now the mythological character and the shade of Beethoven have taken over. The thundering postlude would not be out of place in Wolf’s Prometheus (who was Atlas’s brother-Titan). We have got to know Heine better through the eyes of Robert Schumann, and other later composers. We are familiar with his pathos and his pose, his ability to conjure vast imagery (look at the last of the Dichterliebe songs with its giants and saints, cathedrals and coffins) as a frame for his obsessive examination of every small detail of his emotive life – itself based as much on fiction as fact. If Schubert is not quite on Heine’s wavelength here it is because he has taken the poem at face value, and was possibly attracted to it in the first place as a means of paying tribute to Beethoven. He comes from a generation where words mean what they say. In any case, no composer has ever truly mastered the glint of Heine’s malicious irony (something which is almost impossible adequately to convey in music), not even Robert Schumann. Schubert was truly adept neither in comedy nor in cruelty in music – here Rossini was the master. Nevertheless, Der Atlas is a miracle in its own terms. It is only sad that we will never find out what Schubert might have made of Heine on closer and more protracted acquaintance. Proud heart! you wished it so! Although it has precedents—in his much earlier setting of Goethe’s Prometheus, for instance—Der Atlas immediately signals a new tautness, and corresponding increase in intensity in Schubert’s song-writing. In this the spare outlines of Heine’s verse play a crucial role; like an explosive packed into a small container, Schubert’s music derives all the more power from the confines from which it seems constantly to be trying to escape. This is immediately explicit in the groaning appoggiaturas of the opening bars, which create the interval of a diminished fourth as though defining the narrow confines of Atlas’s prison. When the voice enters, at every step and heave it is dogged by left hand octaves as if dragging a ball and chain. At the climax, it tries one last massive heave, stretching the octave by a semitone before falling back impotently to the tonic, and it is no accident that the agonized top note on ‘Schmerzen’ forms an augmented fourth against the dominant in the piano: known in the middle ages as diabolus in musica, with the piano’s boiling tremolando it is like a victim stretched on the rack. Comme la mise en musique du Prometheus goethéen l’avait fait bien avant lui, Der Atlas signale d’emblée la survenue dans l’écriture schubertienne d’une tension nouvelle, assortie d’un accroissement d’intensité équivalent. Le contour austère de la poésie de Heine joue là un rôle crucial; tel un explosif fourré dans un petit récipient, la musique de Schubert tire encore plus de puissance des limites dont elle semble sans cesse vouloir s’échapper. C’est immédiatement explicite dans les appoggiatures gémissantes des premières mesures, qui créent une quarte diminuée comme pour délimiter l’étroite geôle d’Atlas. Lorsque la voix entre, à chaque progression, à chaque montée, elle est talonnée par des octaves à la main gauche, comme si elle traînait un boulet. Au climax, elle tente un ultime soulèvement massif, étirant l’octave d’un demi-ton avant de retomber, impuissante, à la tonique, et ce n’est pas un hasard si la déchirante note aiguë sur «Schmerzen» forme une quarte augmentée contre la dominante au piano: connue au Moyen Âge sous le nom de diabolus in musica, cette quarte est, avec le bouillonnant tremolando pianistique, comme une suppliciée étendue sur le chevalet. Obwohl Der Atlas frühere Vorbilder hat—z.B. in seiner wesentlich früheren Vertonung von Goethes Prometheus—signalisiert dieses Lied eine neue Straffheit und entsprechend stärkere Intensität in Schuberts Liedkomposition. Hierin spielen die sparsamen Konturen von Heines Versen eine wesentliche Rolle; wie in ein kleines Kästchen gestopfter Sprengstoff erhält auch Schuberts Musik mehr Kraft durch die Beschränkungen, aus denen sie sich ständig zu befreien sucht. Dies wird unmittelbar in den stöhnenden Vorhalten der Anfangstakte deutlich, die das Intervall einer verminderten Quarte bilden, als ob sie die engen Grenzen von Atlas’ Gefängnis definieren wollten. Wenn die Singstimme eintritt, bleiben ihr wie ein Klotz am Bein bei jedem Schritt und Tritt Oktaven in der linken Hand des Klaviers auf den Fersen. Auf dem Höhepunkt macht sie einen letzten massiven Stemmversuch und überspannt die Oktave um einen Halbton bevor sie machtlos zum Grundton zurückfällt, und es ist kein Zufall, dass die letzte gequälte Spitzennote auf „Schmerzen“ eine übermäßige Quarte gegen die Dominante im Klavier bildet: im Mittelalter als Diabolus in musica bekannt, erscheint sie mit dem siedenden Klaviertremolando wie ein Opfer auf dem Streckbett. Dass ich dich verloren hab’! began mysteriously to come alive. as though with melancholy tears. Many of Schubert’s songs have been ignored by the critics and musicologists, but a great deal has been written about these relatively bare thirty-six bars. They have made a deep impression on everyone because this song seems to represent the very bleakness of Schubert’s approaching end; here there is a new stylistic departure which seems to mark the beginning of a journey, all the more poignant because we know that it will never continue. After the start of the group with Der Atlas, an anguished fanfare in music, we realise that Schubert’s new partnership with Heine ranks with that of his collaboration with Goethe and Müller: this is a poet powerful enough to make a difference to how the music sounds. The key is B flat minor, but never was there a more ‘difficult’ key signature heading a more transparent piece of music. (The E flat minor of Schumann’s Ich hab’ im Traum geweinet – also a Heine setting – comes to mind as a parallel.) The piano begins with a dotted minim B flat (an octave shared between the hands) followed by a rest. And then exactly the same again – the same note and the same rest. These two bars were the subject of an enthusiastic passage in Der Tonwille (1921) by Heinrich Schenker, perhaps the most famous name in musical analysis. He proposed that these two B flats were what we would now call a tonal analogue for the act of staring. To have given the tonic note once in a bare unison is one thing; to have repeated it is to imply a second glance, or a stare. It is a rare moment when the formidable and rigorous Schenker is lost for diagrams and abandons his usual analytical apparatus in favour of commenting on the relationship of words to music in this way. But, as he himself says, there is no other way to explain how Schubert ‘shows himself the true magician who binds a secret thread around the exterior situation (here, the staring at a picture), around the soul of the unhappy love, and around us’. What is an unusual way of looking at things for Schenker, however, is common enough for vocal performers. One has to sing and play (as much as stare at) the song picture in order to realise that there is a vast vocabulary of Schubertian word-to-music responses where a verbal idea gives rise to a chord, a phrase, a figuration, a modulation, a turn of phrase, a tonality and so on. New ‘expressions’ in this ‘language’ were continually minted by the composer; these became part of an established vocabulary of tonal analogues to which he continually returned, refining and elaborating the grammar of what amounted to his own secret songwriting language. This had its beginnings in how Haydn, Mozart, Gluck and Beethoven had responded to similar verbal ideas; and it became the legacy in turn of those with the ability to learn and assimilate – the great song-composers who came afterwards, each speaking his own dialect of a special tongue mastered only by the masters. 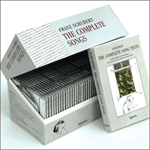 It is in this sense that Schumann, Brahms and Wolf all spoke Schubert’s language. Harmonic analysis (in the conventional sense) of songs by the great lieder composers can begin only after a discussion of the text and the musical responses brought to birth by those words. In this field, harmony and form remain servants of the word, not of a purely musical idea. For unless words were put to music that had already been composed, this would be to put the cart before the horse. So yes, of course, the reiteration of these two ‘gathering’ minims may well imply a stare, or deepening concentration, Schubert’s response to the stillness of the past tense of the verb ‘stand’ (‘stood’) and the colour of the adjective ‘dunkeln’. But we note too that the doubling of voice and piano in much of this song has its own meaning too – it is, in John Reed’s words, ‘an image of loneliness and deprivation’. Schubertians have come to this conclusion by comparing many similar passages in the canon where the same musical device mirrors similarly bleak emotion. The shape of the vocal line for ‘Ich stand in dunkeln Träumen’, with its rise of a minor third followed by a dip to the leading-note and back to the tonic, seems to have been derived from the motif which pervades Der Atlas, and is announced in thundering left-hand octaves in the opening of that song. As with some of the ‘fingerprints’ which unite the Rellstab songs, this interest in cyclical musical procedures which link one song with another is an idea, like so many others in 1828, which Schubert might later have developed to an astonishing degree. The shudder of double-dotted rhythm (rare in Schubert’s songs) at ‘starrt’ ihr Bildnis an’ adds an edge of suspense, even horror, to a scenario which has a supernatural element, even if only in the narrator’s mind. The piano interlude in left-hand octaves at the bottom of the keyboard echoes the double-dotted fragment of vocal melody which we have just heard. The effect is not dissimilar to the ominous trills which punctuate the opening melodic statements of the B flat major Piano Sonata, D960. At ‘das geliebte Antlitz’ the music softens into the major key, a shift which is familiar from the Winterreise songs where the minor tonality represents unpleasant reality, the major a retreat into happy memories of the past. The marshalling of all his concentration (and it is this which the continual unisons and doublings depict) enables the poet to cross the threshold which separates the viewer of the picture from its subject. Whether he imagines his lover comes to life, or she actually does so, lies within the realm of poetic licence. Either way, the bare textures of the music gradually fill out with new growth; after ‘heimlich zu leben begann’ the piano interlude begins with a bare left-hand B flat; the addition of an adjacent semitone creates a minor second (A – B flat), which is followed by a major second (A flat – B flat) ; then the right hand joins in, resulting in a chord in three parts; and suddenly we have a bar of four-part harmony, music so domestic and sweet as to be playable on the parlour harmonium. This is to see a bare outline fleshed out before our eyes, a tree of life sprouting shoots as bare twigs become covered in green foliage. The poem’s second verse describes the animation of the beloved’s features. The modulation from B flat major to G flat major is simply achieved, but it is wonderfully effective; we feel drawn into an intimate and mysterious relationship with the smiling woman. The poet’s engagement with her is equally strange, and our ignorance of the background enhances the enigma. This is eloquent rather than happy music, with an undertow of the deepest pathos. The economy of the writing for voice and piano is unprecedented in Schubert – at times the vocal line seems scarcely harmonised. But this is a calculated, masterful modesty: the singer is made to seem awestruck, humble and grateful for this stolen moment and, yes, utterly repentant (for what misdemeanour or failing we shall never know, but that is typical of Heine). After ‘Lächeln wunderbar’ there is a tiny motif in falling thirds for the pianist, a brief musical twitch for a Mona Lisa smile. The minore colouring for ‘Wehmutstränen’ is equally masterful, and the helplessness of the narrator could not be more obvious in the minimalist accompanying texture. The ‘Augenpaar’ are decorated with a glinting mordent in the vocal line and followed by another falling staccato figuration (tears glistening or tears dropping?). Both of these interjections (significantly, both smiling and weeping are represented by the same notes) represent a real challenge to the pianist: there is so little to do, and so little time to make anything expressive of these tiny touches. The barest of the Winterreise songs seems fulsome in comparison. There is a similar problem for the pianist in introducing the poem’s last verse. This is perhaps Schubert’s most inscrutable interlude, containing a detail which one would long to hear Schubert play himself. Instead of a recapitulation of the two bare B flat unisons of the opening we have fuller chords – both on B flat as before, but this time filled out with portentous minor-key harmonies. A ghost of the smile and the tears, the flickering of supernatural life, remains in the enigmatic semiquaver D flats which the accompanist plays as a fleeting anacrusis to each of the chords. How to make something of these without exaggeration has perplexed every pianist who has played this music. The music for the poem’s third verse is an exact repeat of the first, and it is an important part of the conception that the song should be a simple ABA structure. The prosody of 'Mir von den Wangen herab’ is not ideal (the unimportant ‘von’ is awkwardly emphasised by a long note value) but a detail such as this seems not to matter in the ongoing tread of the music, and the inevitability of its shape. This return to the music of the opening tells us that the moment of closeness and intimacy with ‘her portrait’, more a Proustian trick of memory than magic or witchcraft perhaps, is over. We now return to the initial mood of distance and exclusion. The black despair of ‘und ach, ich kann es nicht glauben / Dass ich dich verloren hab’!’ is expressed in the major key, and it sounds more toweringly woeful than it would have in the minor. The postlude is the same music as for the blossoming tree of life, but it is inflected into B flat minor, and marked forte with stentorian significance. Such a tragic song has to end in the minor, but it was brilliantly perceptive of Schubert to allow the singer to finish in the major; this bitter-sweetness exactly captures the poet’s masochism, and his almost triumphant relish in the inevitability of his own misfortune. From every viewpoint this song is a masterpiece, but perhaps most of all for its ability to enter into Heine’s strangely self-torturing emotional world. In contrast to Der Atlas the pared-down simplicity of Ihr Bild combines bleakness and poignancy in equal measure. 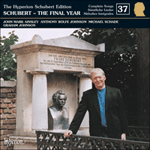 Here perhaps Schubert comes closest to the Schumann of Dichterliebe—it was onto Schumann of course that the mantle of Heine-composer-in-chief would soon fall. But the details are pure Schubert: the bare unisons of the opening, the chromatic inflection of ‘Träumen’ and ‘starrt’’ (the latter approached by the interval of an augmented fourth), the change to major as the image comes to life and the ineffable sweetness with which the girl’s smile is depicted. To all this the piano adds its own commentary, most devastatingly in the final bars: the singer’s expression of disbelief may be voiced in the major, but the postlude, echoing it in the minor, mercilessly drives the reality home. Par contraste avec Der Atlas, la simplicité réduite de Ihr Bild combine à part égale austérité et caractère poignant. C’est ici, peut-être, que Schubert est le plus proche du Schumann de la Dichterliebe—Schumann à qui échoira bientôt, naturellement, le rôle de chef de file des compositeurs de Heine. Mais les détails sont du pur Schubert: les unissons dépouillés de l’ouverture, l’inflexion chromatique de «Träumen» et de «starrt» (abordée, dans ce dernier cas, par une quarte augmentée), les changements en majeur lorsque l’image s’anime et l’ineffable douceur avec laquelle le sourire de la jeune fille est croqué. À tout cela, le piano ajoute son propre commentaire, ravageur au possible dans les dernières mesures: l’incrédulité du chanteur peut bien être exprimée en majeur, le postlude, qui lui fait écho en mineur, ramène impitoyablement la réalité. Im Kontrast zu Der Atlas kombiniert die vereinfachte Schlichtheit von Ihr Bild Trostlosigkeit und Wehmut in gleichem Maße. Hier kommt Schubert vielleicht dem Schumann der Dichterliebe am nächsten—Schumann war es natürlich, der bald den Mantel als wegweisender Komponist von Heine-Texten anlegen sollte. Aber die Details sind purer Schubert: die leeren Unisoni des Anfangs, die chromatischen Wendungen von „Träumen“ und „starrt“ (Letzteres via eine übermäßige Quarte), der Wechsel nach Dur als das Bildnis zum Leben erwacht und die unbeschreiblich süße Schilderung des Lächelns des Mädchens. Das Klavier fügt all dem seinen eigenen Kommentar hinzu, besonders erschütternd in den letzten Takten: der Sänger mag seine Fassungslosigkeit zwar in Dur ausdrücken, aber das Nachspiel spielt sein Echo in Moll und macht die Wahrheit klar. This enchanting serenade is the apotheosis of the barcarolle – at least until Fauré adopted that form some fifty years later. Other love songs in 6/8 (Alinde, Abendlied für die Entfernte), as beautiful as they are, somehow miss the boat in comparison to these undulations which are not so much water-borne as water-aware. The pianist’s right hand floats and weaves, his chords changing shape like so much flotsam and jetsam on the song’s surface, the modulations a metaphor for the new patterns brought about by each incursion of the rolling tide. One of these brings into view the boat of the fisher-girl returning to dry land. There is nothing violent here (although the words refer to storms at sea in the last verse), just the gentle bobbing of waves, and all the time in the world to spin a yarn. We are in full view of the beach, for the song takes place at the water’s edge – the site of Schumann’s Heine setting Abends am Strand when young men, would-be voyagers, tell second-hand tall stories about the exotic lands of far-away. This will lead (hopefully) to first-hand experience in quite a different terrain: these travellers’ tales are meant, after all, to impress the girls, the daughters of working fishermen who help their menfolk with the boats and the daily catch. For me, Schubert’s Das Fischermädchen, if not Heine’s, is a genuinely charming serenade, suffused with a gentle longing as if the singer really cares about the outcome; if he manages successfully to plight his troth the result could well be the life of a happily married couple with a family living in a cottage by the sea. But, until then, the singer has no luck with the fisher-girl; far from being an easy catch, she is as unattainable as any of the women Schubert is said to have longed for. For all the physical proximity suggested by the words, the fisher-girl is, in effect, as distant as any ‘distant beloved’, for Schubert’s music makes her so. She is certainly as distant as the lover serenaded in the corresponding song in the Rellstab cycle – Ständchen. We detect in both these pieces that note of lifelong, rueful melancholy that suffuses anything by Schubert with a sexual undertone. The hunt is not his métier; he would sooner skirt the challenge than challenge the skirt, for he is no good at it; like the miller-boy, he finds hunters unsympathetic. The compensations are many, however: because fulfilment is not on the agenda, longing, and its myriad nuances, becomes an art form in its own right. The song is in A flat major, a key according to John Reed which denotes secure and reciprocated love. If that is so, this quality of affection is something sought by the singer of this music rather than something attained and taken for granted. For me there is a veil of pleading and sadness over this music, a mood extraordinary for a work nominally in the major key. I say ‘nominally’ because phrases like ‘komm zu mir und setze dich nieder’ (verse 1) and ‘und manche schöne Perle’ (verse 3) are harmonised by supertonic harmony – in this case chords of B flat minor. The song inhabits ‘flat’-sounding (and thus soulful rather than merry) keys, and the magical modulation of the second verse into C flat major accentuates this fact. Even the barcarolle Bewegung (‘Etwas geschwind’) implies the singer’s control and consideration rather than his passionate powers of persuasion. The rise to the high G flat at ‘kosen Hand in Hand’ (verse 1) may well suggest the swinging back and forth of entwined arms; in the other two strophes it is less ebullient. But there is no lack of gallantry (not for the first time the character of Don Ottavio comes to mind): after this upward scoop the elegant descent back to the home key (sometimes ornamented with a mordent) seems typical of an Italianate serenata at its most winning. We have already spoken of the shift into C flat major for the second verse. The piano interlude which ushers this in is quite simply one of the loveliest that Schubert was ever to write. And as I play it I imagine the expression on the composer’s face as he scans the face of a loved one, the better to read and understand what he sees there before embarking on the song’s next verse. As different thoughts flash across the face, one mood yielding to another, there are moments of hesitation and lingering, excuses for the tiny moments of rubato with which Schubert’s inspired changes of harmonic direction are lovingly tagged by his interpreters. If the look of a lover, full of gentle concern for the beloved’s welfare, can be translated into music, here it is. The use of the flattened mediant (C flat major in the key of A flat) makes this strophe appear an oasis of intimacy; the words are set to music of such matchless sincerity that we forget that the poet, in saying them, has nothing against the girl risking her life daily at sea, as long as she returns from the storms to bring him pleasure. The final verse is almost an exact repeat of the first. The robust words ‘Sturm und Ebb’ und Flut’ are well suited to the straightforward A flat arpeggio with which they mount the stave. Here even the lyricism of Schubert’s music cannot disguise the self-regarding narcissism of the text. ‘Mein Herz’ says the poet, and that is all that interests him. A man as self-centred as Heine might have written interesting music if he had been capable, but it would never have been this music. Apart from that mis-match, the song is a great one, and occupies an important place in the set – a ray of sunlight glinting on the sea after two songs of exceptional intensity, and before yet another dark and strange fantasia. The postlude is a reappearance of the prelude with an added couple of bars to bring the song to a gently wafting conclusion. In the seemingly innocuous barcarole of Das Fischermädchen, Schubert’s characteristic harmonic shifts suggest his awareness of the potential ambivalence of Heine’s poem. True, there is an insouciance to the piano introduction (with its echoes of male-voice harmony, as in a fishermen’s chorus) and an eagerness each time in the voice’s entry, as it overlaps the piano’s final cadence. But is there a suggestion of ‘lover beware’? Dans la barcarolle apparemment inoffensive de Das Fischermädchen, les transitions harmoniques typiques suggèrent un Schubert conscient de la potentielle ambivalence du poème de Heine. Certes, il y a de l’insouciance dans l’introduction pianistique (on perçoit des échos d’harmonie vocale masculine, comme dans un chœur de pêcheurs), de l’enthousiasme aussi, à chaque entrée de la voix, lorsqu’elle chevauche la cadence finale du piano. Mais faut-il y voir une «mise en garde à l’être aimé»? In der scheinbar unverfänglichen Barkarole Das Fischermädchen deuten Schuberts charakteristische harmonische Verschiebungen sein Bewusstsein der möglichen Doppeldeutigkeit von Heines Gedicht an. Die Klaviereinleitung (mit ihren Echos von Männerchören, wie etwa einem Fischerchor) ist zwar eher unbekümmert und die Singstimme immer begierig einzusetzen und überlappt sich jeweils mit der Schlusskadenz des Klaviers. Aber gibt es einen Hauch von „Liebender hab acht“? the grey stretch of water. the boatman rows my boat. where I lost my beloved. This is one of the strangest songs that Schubert ever composed. Only Der Leiermann at the end of Winterreise can compare with it as music which suppresses harmonic and rhythmic variety to depict the one-track obsessions of someone in extremis. The music is so minimalist here that it might almost be an aria from an imagined John Adams opera entitled Heine in Hamburg. The music, much of it deliberately indeterminate and grey, is based on repetitions of cells. Despite its simplicity, the creation of this music must also have repeatedly exercised the grey cells of the composer: it is certainly the most unusual song of the set, and for many commentators the masterpiece – here is music even more bare and concentrated than that for Ihr Bild. The word ‘impressionism’ comes to mind because here we seem to have only an impression or sketch of a ‘real’ song (the play between reality and unreality is a feature of the text); the harmonies of Die Stadt appear to be only a sketch of what is implied, but never fully stated, on the printed page. The misty visions described in the poem seem worthy of Whistler or Turner, and are depicted with similarly airy brush strokes. The scurrying diminished-seventh arpeggio which recurs unaltered no fewer than seventeen times during the course of the song might have been part of a Debussy prelude or estampe were it not for its refusal to modulate or ingratiate in any way. Images of wind, water and suddenly emerging sunlight suggest Monet perhaps. But beneath the blurred and atmospheric contours of Die Stadt is a core of sharp German seriousness. The town with its turrets on the horizon is painted, if by anyone, by Caspar David Friedrich, and the song takes its place as one of the proud icons of German Romanticism. The town of Hamburg, the scene of Heine’s humiliation in love, is the villain of the piece, as well as its title. The nameless town in Rückblick from Winterreise is unpleasant enough, but only because of its heartbreaking personal associations. In this song, Die Stadt is the site of Heine’s unhappiness which has come about in the context of the host city’s cold impersonality. Indeed one is made to feel that the town is something callous and uncaring in itself. This is a glimpse of how Schubert saw the society of the future and a world he was never to know, the world of steam trains, factories and gas lighting. In Die Stadt he imagined a city that loomed in the distance, large and forbidding, repository of a thousand secrets and heartbreaks, nearer Blake’s nightmare descriptions of London in the 1820s than Vienna in the same period. In 1828 Schubert’s home city was still an 18th-century town in many ways – there was no pollution, no steam power, much less gas or electricity. It was a town of political repression, but the Industrial Revolution had, as yet, passed it largely by. We sense that Schubert sees Hamburg not as he sees his beloved Vienna: here is a modern city, the kind of city he himself would not like to live in. The mood is tense, neurotic, dangerous, unhealthy. Those fixated arpeggios sound a note of claustrophobia, their diminished harmony a type of pollution. Schubert sets the poet’s words without repetitions – in this song there are no rhetorical verbal repeats as there had been in Der Atlas – and the simplicity of the music, combined with the stark strength of its peroration, convey the poet’s loss with the almost offhand concision of Heine at his most bleak. There is much talk of a ‘new Schubert’ with this song. To tell the truth, a new ‘new Schubert’ seems to be born with each of these Heine settings, so strange and compulsive are they, and so different from each other, and from the songs that have gone before. That the poet stamps his own personality on the music (as only the greatest poets can) is without question. The time signature is 3/4, the tempo marking ‘Mässig geschwind’. Soft rolling Cs, demisemiquavers in split octaves, oscillate in the left hand for the first beat. The second and third beats are solitary quavers on low Cs. This procedure is repeated exactly for the second bar. (This recalls the stasis in the introduction to Ihr Bild). Bars 3, 4 and 5 feature exactly the same music, each bar a repeat of its predecessor. For these the same Cs oscillate beneath a right-hand arpeggio which swirls up and down the octave based on the diminished chord on A natural. There are eight notes in the bass and nine in the treble, so these figurations, as they mesh together, never sound tritely neat and tidy, and they are not meant to. We are then reminded that the narrator is sitting in a boat which is being rowed by an oarsman. The second and third beats of each bar are given over to a rowing motif made up of the same diminished harmony. This is an accented figure of two descending quavers, the first of which is a chord, and the second a solitary A – we hear these drooping, sigh-like movements first in the treble stave, and then an octave lower in the bass. These plashing chords seem to represent the oar plying the water, but nothing happens to take the stationary vessel from one point to another. It is caught immobile in time and space, the water as viscous as the Styx, the boat like a barge ferrying the poet to the Underworld. We are reminded that Schubert’s great Gruppe aus dem Tartarus also features shivering arpeggios in an ominous C minor. For the sight of the imposing brute of a town, the music suddenly comes into sharper focus. The double-dotted crotchet figurations that appeared in Ihr Bild (at ‘starrt’ ihr Bildnis an’) were unusual for Schubert, and now here they are again for ‘Am fernen Horizonte’. The act of staring, or in this case scanning the horizon, is common to both songs. The distance between the vocal line and the bass clef harmonies (at ‘ercheint, wie ein Nebelbild’), as well as the pervasive dotted rhythms, is strongly reminiscent of the first page of Die Nebensonnen from Winterreise where the winter traveller looks into the distance as he counts three suns in the sky. The idea of effortful concentration on a distant focal point are common to all three songs. Harmonies shift grandly, but simply, between C minor and its dominant and subdominant. The old-fashioned Handelian rhythms, prompted by mention of the city with its imposing towers and palaces, are descriptive of civic pomp and circumstance. This is the almost operatic backdrop for the failure of the poet’s affair. The second verse begins with mention of the ‘feuchter Wind’. This is of course represented by the arpeggio motif that has appeared in bars 3 and 4 of the Vorspiel. But nothing, surely, could prepare us for the use of this bar no fewer than eleven times as an accompaniment for a vocal line, also fashioned from diminished harmony, which swirls down the stave in woebegone sequences, a third apart. The effect of this withdrawn music is of a slowly spiralling leaf caught in the autumn wind. With the words ‘in meinem Kahn’ the voice reaches C at the bottom of the treble stave. The lowest point in the song thus represents the height of its introspection. The arrival of the sun, itself a distant monarch of sorts, occasions another forte pomposo passage with a solemn oratorio-like tread. The music is similar to that for the first strophe, but placed in a higher and grander tessitura. The flattened supertonic, such a feature of these songs, is magnificently jarring for ‘und zeigt mir jene Stelle’. The impression is of someone unhinged with grief, and the high G for ‘Liebste verlor’ is one of the great and chilling pay-off moments of Schwanengesang in terms of sheer vocal power. Capell correctly analyses why this is a particularly effective setting as far as Heine is concerned: ‘The cry of the poet’s loss on the 6-4 minor chord is uttered wildly; but lost is lost, and there is no more to be said’. Here then is an workable musical equivalent of Heine’s ‘sting in the tail’. One can imagine the words ‘Where I lost my beloved’ being said more quietly as a clinching throwaway if the poem were to be read. But one of the strangest features of this song is the composer’s deliberate decision to make things in the distance appear in sharp (and loud) musical focus, and the things in near vision – the boat, the rowing, the water – appear to be hazy and indistinct. This bizarre reversal of perspectives shows that the past (the distant city, and memories of his lost love) is now the only place where the narrator is truly alive. The song ends with the same five bars with which it began. There is an important new point – the very last note of all. This is a single minim C with a fermata on the last beat. Schubert thus avoids his obligation, as a good and well brought-up pupil of Salieri’s composition class, to resolve the discord of the last diminished seventh. The music moves directly from the diminished chord to that solitary low C. Are we supposed to imagine a C major or minor chord there? Maybe we hear only an impression of one with that low C. If this is as flagrant a breach of the rules as one suspects, we must wait until the next song to find out. In Die Stadt Schubert deploys his pictorial skill to revolutionary effect, creating a watery stasis through nothing more than the suggestion of a pedal-point timpani roll and the incessant flutter of a single diminished seventh, constantly repeated. Together with the mysterious brass chords that evoke the city’s towers and pinnacles, it is an impressionistic vision every bit as revolutionary as the misty seascapes Turner was painting at much the same period. Dans Die Stadt, Schubert déploie son art pictural avec un effet révolutionnaire: il crée une stagnation aquatique par la simple suggestion d’un roulement de timbales-pédale et par l’incessant battement d’une unique septième diminuée, sans cesse répétée. Avec les mystérieux accords de cuivres évoquant les tours et les pinacles de la ville, c’est un tableau impressionniste en tout point aussi révolutionnaire que les marines embrumées peintes par Turner à peu près à la même époque. In Die Stadt setzt Schubert sein tonmalerisches Geschick mit revolutionärer Wirkung ein und kreiert durch nichts außer der Andeutung eines Paukenwirbel-Orgelpunkts und das unablässige Flattern einer einzigen stetig wiederholten verminderten Septime eine wässrige Stille. Zusammen mit den mysteriösen Blechbläserakkorden, die die Türme und Spitzen der Stadt evozieren, wird es eine impressionistische Vision, die genau so revolutionär ist wie die nebligen Seelandschaften, die Turner um die gleiche Zeit malte. we sat silent and alone. a seagull flew to and fro. I saw them fall on your hand. I drank away the tears. and my soul dies of longing. According to the rules of classical harmony, the single low C minim following a diminished-seventh harmony at the end of Die Stadt had left that song’s closing harmony unresolved. What follows, at the beginning of Am Meer, is the strongest possible argument that Schubert’s order for the songs in this Heine group was his own, and not in the least fortuitous. Am Meer opens with the chord of the German sixth in C major (C + A flat + C + D sharp + F sharp + C) which immediately resolves on to the tonic. If this bar is played immediately after Die Stadt, the final chord of that song is resolved by the first of this one as we move from C minor to C major. The manuscript reveals that Schubert had originally ‘spelled’ this opening chord as: C + A flat + E flat + C + F sharp + C. This adds weight to the theory that he regarded the diminished-chord harmony of Die Stadt as related to the opening harmony of Am Meer, and that he wished the songs to be somehow linked to each other in performance. It shows that the composer, by his very inmost nature, was no confrontational revolutionary. He is cheeky enough to make us think he is an anarchist, but he slyly backtracks and acknowledges convention in a way that surprises (and delights) us with his cunning. The opening also reminds us of another work in C major – the String Quintet – where the music fills out into a similar chord after the opening unison Cs. The alternation of these two pivoting tonalities is familiar as a symphonic motif, and Schubert did not invent it. But in both works it signals a certain majesty, and the Quintet and this mighty song share a certain C major grandeur. Am Meer is short in length (only two pages in the Peters Edition) but massive in effect – the broad, open vistas and endless shoreline of Heine’s beloved North Sea are built into the music. (Here we are reminded that both settings of the Adriatic Gondelfahrer are also in this key). Schubert’s experience of water was confined to streams and lakes, but, as in Meeresstille, he was somehow able to conjure great stretches of sea, sand and sky in music in the great ‘empty’ key of C major. If he had heard Heine’s Reisebilder read aloud by Schober (as he almost certainly did) he would have known how the poet felt about this part of north Germany near Cuxhaven (‘I love the sea like my soul’ and ‘The sea is my soul’ Heine wrote to his publisher Campe). One fancies that the ache of that love is somehow built into this music, the backdrop as important as the sad relationship described in the foreground. Heine’s four strophes are treated as two identical musical verses, each of which is divided into two parts, the first reflective, the second more active. Unless these Heine songs date from much earlier in 1828, this is Schubert’s last strophic song, the final example of a form which had prompted him to so much expressive music. Often this was a means of exercising a discipline over his own prolix tendencies; to use a comparison from instrumental music, the strophic song encouraged the composer to favour the sonata or rondo form rather than the freedom of the fantasia. It was usually easy enough for Schubert to write new music for a new verse of poetry; but the strophic form had taught him to hone and polish what he had already written, and the intellectual challenge of creating diversity in unity was also a stimulus. But we may ask ourselves why the song is cast in this form at all. The poem, a strange and difficult one with a ‘sting in the tail’, is partly a mood-picture and partly a narrative. The poem takes place by the seashore so the inference is that the woman is a ‘Fischermädchen’, a holiday romance rather than anyone permanently involved in the poet’s life. At first, the description of the lovers (‘silent and alone’) is static; then it is counterpointed by a great deal of movement (rising mists, swelling waves, flying seagulls, falling tears). In the third verse the lovers are less fixed to the spot; the poet falls to his knees and the strange tear-drinking episode ritual is enacted. The consequences of this are couched in the most ambiguous terms in the final stanza: is the poet a victim of some supernatural power, the women a Lorelei, and the poet undone by Undine? Is his ‘poisoning’ merely a metaphor for his being addicted to the beloved and unable to live without her, or is it a metaphor for venereal illness? (A phrase like ‘Vezehrt sich mein Leib’ might have prompted Schubert to recall his fateful encounter where illness was the result of reckless love.) Or is Heine simply playing with the reader at the poem’s ending by balancing the overwhelming sentiment of the first three strophes with a sudden pistol shot of a line, a slap in the face for the woman who is dismissed as an ‘unglücksel’ge Weib’. In terms of the poetry at least, this description of the physical consequences of the poet’s impetuous tear-drinking is a descent into bathos. We are left with the feeling that Heine himself might have delivered this final line with a curl of the lip and a smile of bitter self-deprecation. The other thing we notice about the poem (though perhaps not at first, so vivid are the descriptions) is that the whole story is recounted in the past tense. Schubert chooses to concentrate on this aspect of the poem. It is true that at the end Heine tells us that his body continues to be consumed, and that he is dying of longing, but there is no telling how long ago the scene had been enacted. Schubert’s timeless music swathes the poem not only in sea mists, but also in the mists of time. The only difference between these lines and a strange fairytale is the word ‘wir’ (we) which immediately casts the singer in a narrative role in the first person. But it is the fairytale aspect that appeals to Schubert, and it solves the problem about how to deal with the awkward final strophe: any irony or ‘contemporary’ viewpoint is ironed out in favour of a heartfelt ending. This narrator is caught in the web of a story like the Flying Dutchman (another Heine creation as it happens); it is as if he recounts the strange sequence of events time and time again – perhaps, like the Ancient Mariner – to whomever will listen to another performance of the song. And in so doing, his music becomes a magical incantation rather than a realistic description of obsession and betrayal in the here-and-now. It is the grandeur of the song’s resignation, somehow loftily removed from the immediacies of human strife, that encourage this interpretation. As if to frame this set piece, the opening chords sound like an overture (the identical chords are repeated at the end of the song, as if slowly bringing the curtains down on the story). The entry of the voice follows a fermata, but the vocal line begins without fuss or prevarication. This is Schubert in his Das Wirtshaus or Die Nebensonnen mode where the doubling of voice by piano, as well as a rhythm that would not be out of place in a hymnal adds to, rather than detracts from, the poetic power of the whole. The tessitura, as Capell points out, is demandingly high – not of the kind to challenge Ludwig Titze (cf Lebensmut among other songs) but requiring a firm, sustained line and marvellous breath control. This eloquent placing of the voice, perhaps a third higher than the average lieder tessitura, gives the song a certain operatic dimension, not because of the dynamics which are mostly quiet, but in terms of the added tension and ‘stretch’ in any voice asked to sing slowly in such a position on the stave. This adds to the formality of the music’s effect, rather than making it more immediate. The lied, after all, is usually pitched nearer to the tessitura of human speech. C major is a key in which one may luxuriate in consonance, and the vocal line (as often in Schwanengesang) is enriched by sounding in thirds and sixths with the accompaniment. (This is another song that could easily have had a horn obbligato like Auf dem Strom.) This euphony can sound commonplace and sentimental, but it can also strike a lofty note; Gustav Mahler exploited this popular touch to marvellous effect in songs of the utmost pathos. (A great composer like Poulenc could make music of the café appear unbearably poignant.) Heine’s pathos is surely part of the expressive legacy of the Jewish tradition he shared with Mahler. Which leads us to remember that in July 1828, probably at about the same time he was writing this song, Schubert set Psalm 93 for his friend the rabbi and cantor, Salomon Sulzer. In order to do so he must have listened to Jewish liturgical music and learned something about Hebrew. This is worth mentioning here because, if the plaintive sound of cantorial music is to be found anywhere in Schubert’s lieder, it is in the elegiac desperation of Am Meer, the very tessitura of the voice appropriate for a call to prayer. (Even the decorations at the ends of the words 'Abendscheine' and 'gesunken' have the in-built flourishes of that tradition.) Because Am Meer is a song at twilight, we might also mention that Im Abendrot, another alla breve prayer at sunset, is written in the same exacting tessitura. ‘O wie schön ist deine Welt’ says the poet Lappe (‘O how beautiful is your world’), which is in the spirit of Heine’s nature description too. If prayer played a part in the song’s genesis (and this would involve Schubert’s having chosen to show in musical terms that he understood something of the poet’s Jewish background) the ritualistic nature of the music would be more understandable. The poem’s second verse is set differently (the song’s structure is ABAB). The music changes from C major to C minor, and the accompaniment becomes ruffled in oscillating demisemiquavers as the sea is whipped into foam by the wind. The poetic image is one of mist (‘Der Nebel stieg’) and these obfuscating ripples of sound suit this picture perfectly. It is, incidentally, a moot point whether or not these tremolandi are measured. Schubert is here poised between the Classical and Romantic traditions; the other song with a similarly windswept middle section is the Collin setting Wehmut where the composer makes it clear he wants measured sextuplets. The descent of the solitary seagull (‘Die Möve flog hin und wieder’) is a marvellous picture: the vast expanses of grey sky which it mournfully traverses are almost visible in the downward sweep of the vocal line. Maritime observation now ceases in favour of the beloved whose weeping is described in a passage of the highest romantic melancholy, a heaviness of emotion we associate with a later part of the century than Schubert’s. Indeed, Mahler could easily have incorporated the music for ‘fielen die Tränen nieder’ into his songs. This musical phrase is made up of two identical falling figures, each with an added accent in the vocal line, a marking uncharacteristic of Schubert; the fervid tone of pleading as the phrases are repeated in almost gestural terms would not seem inappropriate to accompany the tearing of clothing in grief-stricken ritual. ‘Nieder’ finishes in the dominant. It is a simple matter to return to the tonic after a single bar’s interlude. (This is an echo of the preceding cadence with its touch of C minor harmony.) The extraordinary events of the poet’s third verse are described in music that has previously painted the couple sitting silent and alone in the sunset. Such is the momentum of the song’s construction in sheerly musical terms, however, that the music seems inevitable, and unarguably appropriate for the words. The idea of a prayer, the feeling that there is something religious about this music, returns powerfully when the poet kneels before his lover as if she were a holy icon. Fervent worship has never been more intensely described in song, the vast simplicity of the emotion underpinned by grave and beautiful switches between tonic and dominant. The drinking of tears from someone’s hand is a disturbing concept, but in this sublime musical context it is an occurrence we accept without question. The second musical strophe now continues into the poet’s fourth verse. Once again tremolandi begin to shiver, this time describing neither mist nor gull but the workings of a dreadful inner sickness. The idea of the body being consumed (‘verzehrt sich mein Leib’) is brilliantly caught in the busy piano writing, the whirring demisemiquavers like an onslaught of overactive cells destroying the body from within. By now the momentum of expressive emotion that has been built up is such that Schubert seems not to care that the strophic structure has resulted in the faulty accentuation of ‘Mich hat das unglücksel’ge Weib’ (a dotted crotchet on the unimportant ‘hat’). The parallel sixths of ‘unglücksel’ge Weib’ are once again Mahlerian, this time uncannily prophetic of Oft denk’ ich, sie sind nur ausgegangen! from Kindertotenlieder. The final ‘vergiftet mit ihren Tränen’ is set to the same doleful music, suggestive of ritual, as before. The embellishment of the final ‘Tränen’ (unlike the first verse) adds a new expressive detail. (We are reminded that Brahms, at the end of Sapphische Ode, sets the closing ‘Tränen’ with exactly the same turn of phrase, as if in loving homage to Schubert.) But the old-fashioned nature of the ornament (once again arguably cantorial) distances us from the immediacy of the emotion in an extraordinary way. This is part of the song’s strange magic, for Am Meer is a monumental song rather than a touching one in the usual Schubertian sense. The two bars of postlude (German sixths resolving into C major) add to the sense of mystery. These chords offer little sense of release. On the contrary, in ending as it began, the song becomes open-ended and we are left hanging in the air. The narrator’s fate is also suspended into eternity; he will be doomed to repeat his ritual of misfortune like a ghost which can never be laid to rest. This circular aspect of the poems seems to be a sub-theme of the Heine cycle as a whole: Der Atlas is doomed to hold the world on his shoulders for eternity; one senses that the coming-to-life of Ihr Bild will be re-enacted time and time again; the courtship of Das Fischermädchen will never come to a satisfactory conclusion; and the distant horizon of Die Stadt will be scanned ceaselessly, and in vain. As for Der Doppelgänger, he will forever stand wringing his hands in that haunted street. Or will he? If Am Meer resolves Die Stadt in harmonic terms, it solves nothing of its textual mystery. We will find quietus only in the closing bars of the final song. Am Meer is a seascape, suggesting a painting by Caspar David Friedrich, with a pair of figures by the shore, their backs turned to the viewer and gazing out to sea. Heine never used many words when fewer would do, and here, as in all these remarkable poems the listener is left to fill in the gaps in the narrative. Schubert himself paints the scene with a musical device that is also tailor-made to heighten the emotional intensity. In the opening chorale-like melody, the voice is descanted by the piano playing a third higher, in a vivid depiction of the evening light gleaming on the surface of the sea. But this descant also serves to intensify—in a manner Schubert had already perfected in Winterreise—both the woman’s tears in the first verse and the singer’s anguished realization at the end of the second. Am Meer est une marine rappelant un tableau de Caspar David Friedrich, celui où deux personnages, debout sur le rivage, contemplent la mer, le dos tourné au regardeur. Heine n’utilisait jamais beaucoup de mots quand peu pouvaient suffire—et, comme dans tous ces admirables poèmes, c’est à l’auditeur qu’il incombe de boucher les trous de la narration. Cette scène, Schubert la brosse grâce à un procédé musical également taillé sur mesure pour exacerber l’intensité émotionnelle. Dans la mélodie liminaire de type choral, le piano exécute un déchant contre la voix, à la tierce supérieure, et nous livre une vive représentation de la lueur vespérale brasillant sur la mer. Mais ce déchant sert aussi à intensifier—d’une manière que Schubert avait déjà parfaite dans la Winterreise—et les larmes de la femme (première strophe) et la déchirante prise de conscience du chanteur (fin de la deuxième strophe). Am Meer ist eine Seelandschaft, die an ein Gemälde von Caspar David Friedrich erinnert, in dem zwei Gestalten mit dem Rücken zum Betrachter am Strand stehen und aufs Meer hinaus schauen. Heine verwendete nie viele Worte, wenn es wenige auch taten, und wie in all diesen bemerkenswerten Gedichten, muss der Hörer auch hier die Lücken in der Erzählung füllen. Schubert selbst zeichnet die Szene mit einem musikalischen Mittel, das ebenfalls maßgeschneidert ist, um die emotionale Spannung zu erhöhen. In der einleitenden choralhaften Melodie spielt das Klavier einen Diskant in der Oberterz zur Singstimme und illustriert so lebhaft den Schimmer des Abendlichts auf der Meeresoberfläche. Aber dieser Diskant dient auch dazu, sowohl die Tränen der Frau in der ersten Strophe als auch die qualvolle Erkenntnis des Sängers am Ende—in einer Manier, die Schubert bereits in der Winterreise perfektioniert hatte—darzustellen. This is one of the most famous songs of all time. Like many of the greatest creations in art, it astounds us by its simplicity as much as its complexity. Schubert’s long apprenticeship had been unlike that of lesser mortals certainly – so many masterpieces were created along the way that to speak of his indenture seems nonsense. But even the greatest composers set themselves aims, and the determination to improve is not confined to those with lesser gifts. Schubert’s complex posthumous relationship to Beethoven, which had been so much a feature of 1828, was born of a combination of just such humility, as well as healthy ambition. From the beginning he had pursued the ideals of clarity and concision married to the greatest expressiveness. In this structural context he treated his fathomless gift for melody, pur sang, as an irrelevance. It was as if he thought ‘anyone can write pretty tunes … I want to compose’. Of course his gift for melody is inextricably bound up with his genius, but it is possible to see in the seeming tunelessness of Der Doppelgänger the culmination of a lifetime’s hard work. Close listening (and remember we have the advantage of sophisticated 21st-century ears) reveals what Schubert was aiming at: melody not for its own sake, but subject to the words, and truthful to their contours; spoken song and sung speech so convincing and powerful that we cease to notice which is which. Die schöne Müllerin and Winterreise had proved his mastery of this new terrain. He had already conquered much new territory; each peak scaled had seemed the highest yet, an exploratory ne plus ultra. But until the very last month of his life there was always another door opening out on to a new vista. 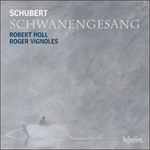 In some ways the songs of Schwanengesang (for all the brooding intensity of the majority of them) are the result of a more relaxed mastery where innovative daring is handled with a lighter, more varied touch than we encounter in Winterreise. Schubert seems not to shoulder the world like Der Atlas, but to have it in the palm of his hand. Doubtless Beethoven’s death, leaving the field clear for a successor, had much to do with his new confidence. Acutely aware of his mortality since the onset of his illness in late 1822, it is a moot point whether this awareness was somehow further heightened in those fabulously creative months of 1828. One can understand why this has become a biographical commonplace, for it might help to explain the composer’s prescience at this stage of his life: in 1828 he is a step ahead of everyone (including us, the listeners). The scope of his vision seems uncanny, even uncomfortable. Nowhere is this more apparent than in Der Doppelgänger; on the threshold of his own death, he seems to anticipate the thought and aims of his great successors. In 1828, if a time-machine had been able to transport him to the desks of Wagner and Wolf, one senses he would have found their marriage of word and tone comprehensible, and related to his own. And yet Der Doppelgänger, as if this spectre were desirous of including the whole of music in his all-encompassing arms, owes almost as much to the past as to the future. It is, after all, a song which ends with the words ‘in alter Zeit’ (‘in days long past’). Schubert had written songs in the old style before (Vom Mitleiden Mariä, Pax vobiscum among others) but the cantus firmus of this song, a four-bar passacaglia which is at the very heart of the music’s sinister and thrilling progress, is almost unprecedented in his music. How much Schubert knew about early music is difficult to ascertain. Perhaps he had access to Raphael Kiesewetter’s remarkable library of vocal scores from earlier centuries; perhaps he had been influenced by the loan of Handel’s complete works, a Gesamtausgabe that had once belonged to Beethoven (and here one feels that almost all Schubertian paths in this year lead back, somehow, to Beethoven). Christopher Gibbs has pointed out the possible inspiration of the C sharp minor fugue from Book 1 of Bach’s Das wohltemperierte Klavier. Whatever the inspiration or spur, whether Handel via Beethoven, or the prospect of studying fugue with Simon Sechter, Der Doppelgänger is unique in being one of Schubert’s most avant-garde works at the same time as one in which the techniques of the past are given a new prominence. As we have said, the cantus firmus of this song (‘with a hint of Dies irae’ Capell says) is almost unprecedented, but not quite. The same theme in dotted minims, this time in C minor (C – B natural – E flat – D), is announced as a fugal subject at the beginning of the Agnus Dei of Schubert’s E flat major Mass (D950, June 1828). This work was written for the church in the Alsergrund where Beethoven’s body had been taken on the day of his funeral in March 1827. (Yet again we find ourselves noticing that in 1828 most Schubertian paths seem to lead to Beethoven, including that composer’s use of fugue in many of his late works.) In Schubert’s Mass the fugal exposition of this theme is dark, even menacing, the soul-searching of the syphilitic only too aware of the meaning of ‘peccata mundi’. After yielding to a smoothly consolatory movement in E flat major (‘Dona nobis pacem’) the ‘Doppelgänger’ theme is recapitulated in an E flat minor contrapuntal passage of towering majesty. A final ‘Dona nobis pacem’, a short movement of eerie beauty, brings the Mass to a close. Here the composer allows himself (bars 221/222) to set the word ‘pacem’ to a haunting derivative (G – A flat – C – B natural) of the chromatic motif. Schubert had often quoted his songs in instrumental works. If, as seems likely, the Heine songs date after June 1828, the process is here reversed. But what is the significance of the quotation? The tormented narrator of the song is in search of a solution to his heartbreak; he sees his ghostly double – a sign, according to German folklore, of his own impending death. Death at least will bring release from pain; it will bring peace. In Schubert’s mind the ‘Doppelgänger’ motif is resolved by the idea of ‘Dona nobis pacem’, just as it had been in his Mass: ‘Give us – and all those that suffer and are in pain – peace’. If the first song in the Heine group, Der Atlas, personifies the Beethovenian struggle, it might not be too fanciful, then, to see in the last song the ghost of a requiem for that composer’s troubled soul, and for the entire cast of troubled characters in these Heine lieder. The sublime eloquence of the postlude, eight chords in eight bars as significant as any Schubert wrote, betokens a journey so profound as to make this a possibility. This could well signify a wordless ‘Dona nobis pacem’ which would explain why the matchlessly moving major-key ending of Der Doppelgänger seems to be is the only true moment of resolution and release in the entire group of six songs. Without such an explanation the apparently unmotifated (so to speak) tierce de Picardie with which the work ends seems perplexing. The key is Schubert’s woebegone tonality of B minor. That famous four-minim figure begins its weary, but strictly measured, trudge through the music: I – V (in first inversion) – I (in first inversion without the tonic, so the chord could also masquerade as D major with a missing A natural) and V (second inversion). And then the same pattern once again. Over this the voice enters in a taut obbligato, a monotone (‘Still ist die Nacht’) leading to a tiny descending phrase on the tonic chord for ‘es ruhen die Gassen’. Suspense and fear are evident in the strictly controlled dotted rhythms. The third appearance of the four-bar passacaglia (as well as the fifth) is altered to include the chord of D major on the third bar (under ‘wohnte mein Schatz’). Over this the vocal line quickens with creepy melisma, as if the singer were breaking out into a cold sweat. An interlude in the piano imitates and echoes the shudder implicit in the voice – at the last moment an F sharp7 chord is embellished with a tiny tremor. And so it goes on, the third and fourth lines of the strophe being a musical repeat of the first and second with the subtle addition of even more ghoulish ornament. The sight of the spot where his lover’s home stands is enough to give the singer a nasty turn (at the words ‘auf demselben Platz’). Because of the independent menace of the bass passacaglia, voice and piano seem to have led a separate life from the beginning of the song, as if the piano was a separate entity from the singer. They are entwined at the same time as being independent, as if part of a masterly contrapuntal weave. Martin Chusid in his enlightening Companion to Schwanengesang: History, Analysis, Performance (Yale, 2000) avers that the skeletal dotted minims of the piano part might be taken to embody the spectre. If this is the case, the ghostly double has hovered unseen from the beginning and will only be confronted by the singer at the song’s climax. This face-to-face confrontation, the ‘jarring of two hemispheres’ in Der Doppelgänger where voice and piano come together at last is one of the most frightening moments in all music. When this ‘august event’ and its description are compared with the unfolding facts of Schubert’s destiny and imminent death it becomes even more frightening. It is as if in wanting so much to honour the dead Beethoven, in wanting so much to occupy his place, in wanting so much to be like him, Schubert suddenly catches sight of how their destinies are indeed the same, but not at all in the way he had hoped. What lay in store was not the honoured position of being Vienna’s greatest composer but a one-way ticket to the Währinger cemetery where their graves would lie side by side. This is fanciful of course, but such a song encourages such thoughts. The final stanza is no less astonishing, no less frightening. It is new in several ways: at last the accompaniment is allowed to break out of the repetitive pattern. As the spectre is addressed directly (‘Du Doppelgänger, du bleicher Geselle!’) the underlying harmonies rise in dotted minims, a semitone at a time. This progress from B minor up to D sharp minor leads to the beginning of the furious question: ‘Was äffst du nach mein Liebesleid?’. Schubert’s direction that this music should be sung and played in the context of an extended accelerando is also extremely rare in his songs (Gretchen am Spinnrade is the only other famous example). There are cadences at ‘Liebeslied’ and ‘Stelle’ on the dominant of D sharp - A sharp major – which sounds like B flat major in the context of B minor (cf this use of this contrast in In der Ferne). The return to B minor for the high and held F sharp on ‘so manche Nacht’ encapsulates the wail of someone caught up in a curse condemning him to suffer eternal damnation. And as if to remind us in closing that the song owes its existence to early music, the cadence at ‘in alter Zeit’ is extended into a melismatic flourish which is gravely formal and infinitely woeful. The postlude has already been discussed, but the switch into C major for the fourth bar is one of those Schubertian harmonies which we might imagine has the power to stop planets in their courses. Unbelievably poignant and new-sounding here, the flattened supertonic is frequently to be found in Schubert’s interpretation of the sound-world of Heine’s lyrics. You wraith! You pallid companion! The final brooding chords of Am Meer prepare us for the night and silence of Der Doppelgänger. Much of this song’s power derives from Schubert’s use of repetition. First, there is the piano’s Dies irae-like ground bass, circling ominously within the eerie interval of a diminished fourth (compare the bass of Der Atlas); then the singer’s obsessive returning to the same note, F sharp in the original (see In der Ferne), as he describes the scene, and indeed tries to decipher it for himself; and finally the fact that this note is present in every single chord up to the moment of horrified recognition on the word ‘Gestalt’. From this point however all harmonic rules are torn up, the bass starts to rise chromatically, the word ‘äffst’ shifts enharmonically to D sharp minor (‘Why do you ape the pain of my love?’) and it takes yet another cataclysmic chord from the piano to wrench the music back to the home key and the singer’s last despairing cry. The final playout of Der Doppelgänger poses an interesting question. As the piano reverts to its ground bass, Schubert unexpectedly re-harmonizes the fourth chord, preparing for the warmth of a dominant seventh and a plagal cadence complete with tierce de Picardie. Is the sudden flash of colour one final turn of the emotional screw, or is it an exorcism, an ironic benediction? Perhaps it is Schubert himself saying to the spectre ‘Rest in Peace’. If so, it makes less abrupt the change of tone to the final song of Schwanengesang, a song which has won hearts by its charm and, as the last song Schubert wrote, comes to us as a voice from beyond the grave. Les menaçants accords finals de Am Meer nous préparent à la nuit et au silence de Der Doppelgänger, un lied qui puise l’essentiel de sa force dans l’usage schubertien de la répétition. D’abord, il y a la basse obstinée, à la Dies irae, du piano, qui accomplit d’inquiétantes révolutions au sein d’une sinistre quarte diminuée (à comparer avec la basse de Der Atlas). Puis c’est le retour obsessionnel du chanteur à la même note, fa dièse dans l’original (cf. In der Ferne), quand il décrit la scène et tente, en réalité, de la décrypter pour lui-même. Enfin, il y a la présence de cette note dans absolument chaque accord jusqu’à l’instant de compréhension horrifiée, au mot «Gestalt». Dès lors, cependant, toutes les règles harmoniques sont battues en brèche: la basse se met à s’élever chromatiquement, le mot «äffst» passe enharmoniquement à ré dièse mineur («Pourquoi singes-tu la douleur de mon amour?») et il faut encore un accord cataclysmique, au piano, pour forcer la musique à retrouver la tonalité principale et le dernier cri désespéré du chanteur. La toute fin de Der Doppelgänger soulève une intéressante question. Quand le piano revient à sa basse obstinée, Schubert ré-harmonise inopinément l’accord de quarte, en vue de la chaleur d’une septième de dominante et d’une cadence plagale avec tierce de Picardie. Mais ce brusque éclat de couleur est-il un ultime tour de l’écrou émotionnel ou bien un exorcisme, une bénédiction ironique? Peut-être est-ce Schubert lui-même qui dit au spectre «Repose en paix». Cela adoucirait alors le changement de ton par rapport à la dernière pièce du Schwanengesang, un lied qui a conquis les cœurs par son charme et qui, parce qu’il fut le dernier de Schubert, nous arrive comme une voix d’outre-tombe. Die abschließenden Akkorde von Am Meer bereiten uns für die Nacht und Stille von Der Doppelgänger vor. Dieses Lied erhält viel seiner Kraft aus Schuberts Gebrauch von Wiederholung: der dem Dies irae ähnliche Basso ostinato, der unheilvoll innerhalb des gespenstischen Intervalls einer verminderten Quarte kreist (man vergleiche den Bass in Der Atlas); dann die obszessive Rückkehr des Sängers zur gleichen Note, Fis in der Originaltonart (siehe In der Ferne), als er die Szene beschreibt und für sich selbst zu enträtseln sucht; und zuletzt die Tatsache, dass diese Note bis zum Moment der entsetzten Erkenntnis beim Wort „Gestalt“ in jedem einzelnen Akkord enthalten ist. Von dieser Stelle an werden jedoch alle harmonischen Regeln aus dem Fenster geworfen; der Bass beginnt chromatisch zu steigen, das Wort „äffst“ wechselt enharmonisch nach dis-Moll („Was äffst du nach mein Liebesleid?“), und es braucht einen weiteren katastrophischen Akkord des Klaviers, um die Musik in die Grundtonart und den letzten verzweifelten Aufschrei des Sängers zurückzuzerren. Das letzte Nachspiel in Der Doppelgänger wirft eine interessante Frage auf. Wenn das Klavier zu seinem Basso ostinato zurückkehrt, harmonisiert Schubert überraschenderweise den vierten Akkord anders und bereitet uns für die Wärme eines Dominantseptakkords und einer Plagalkadenz komplett mit pikardischer Terz vor. Stellt dieses plötzliche Aufflammen von Farbe ein letztes Anziehen der emotionalen Schraube dar oder ist es ein Exorzismus, ein ironischer Segen? Vielleicht ist es Schubert selbst, der „Ruhe in Frieden“ zum Gespenst sagen will. Wenn das so sein sollte, würde es den Tonwechsel zum letzten Lied des Schwanengesangs weniger abrupt machen. Dieses Lied hat sich mit seinem Charme Herzen erobert, und als das letzte Lied, das Schubert komponierte, kommt es als Stimme von jenseits des Grabes zu uns.